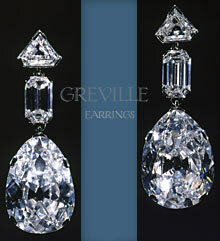 Above, the Greville Diamond Drops Earrings , bequeathed to Queen Elizabeth, later The Queen Mother. Her biography, feature stories and background information including a timeline, family tree . Mrs. Ronald Greville, later Dame Margaret (Helen Anderson) Greville, née McEwan (d. 1942). Daughter of the Rt. Hon. William McEwan, M.P. and heiress to his fortune from the brewery company; m. (1891) Hon. Ronald Henry Fulke Greville, eldest son of 2nd Baron Greville. 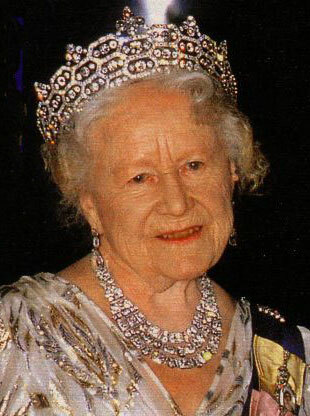 Her Majesty the Queen Mother wearing the five row necklace, also a gift of Mrs Greville. 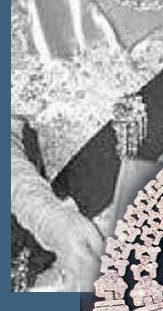 Queen Elizabeth the Queen Mother used the 5 row necklace when King Frederik IX and Queen Ingrid were in Great Britain on astate visit in 1951. 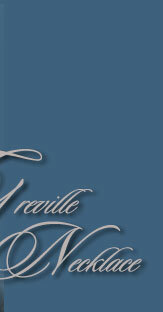 It is called the Greville necklace; the necklace consists of 2 necklaces on of two rows and the second of three. In the new official biography of the late Queen Mother by William Shawcross, pages 231-33 deal almost excusively with the Greville inheritance. At her death Mrs Greville left a staggering £1.5 million, with all jewels except those already bequeathed going to the Queen. 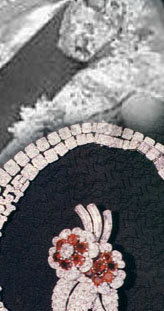 The jewels remained in their boxes for several years as the King was unsure of accepting gifts from subjects. 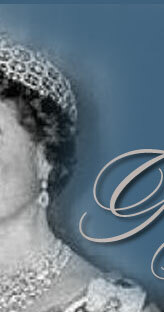 The Queen finally wore Mrs Greville's tiara for the first time in 1947. Above it is shown in the original version. 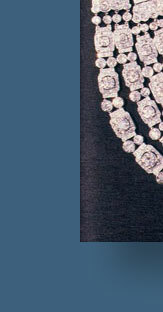 Later, it was altered by Cartier with the strict geometric line being broken up by the addition of diamonds on the top. 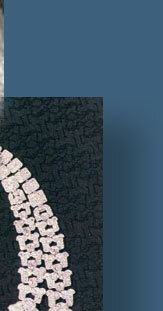 According to Munn, the added height used "diamonds given to Edward VII by de Beers in 1900". The jewels remained in their boxes for several years as the King was unsure of accpeting gifts from subjects. 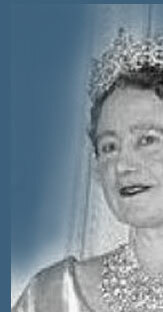 The Queen finally wore Mrs Greville's tiara for the first time in 1947. 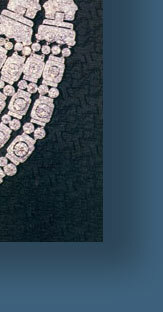 Above in the original version, later, it was altered from Cartier with several diamonds on the top. 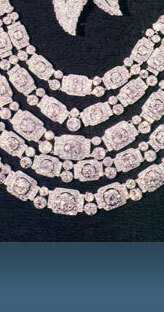 According to Munn, the added height (work by Cartier) used "diamonds given to Edward VII by de Beers in 1900".